Calvary Christian has taken the CA university system to court over alleged discriminisation. Here's the story. The University of California system rejected that school's coursework in biology, physics, history, government and English because of the texts used in the courses. The texts were published by Bob Jones University Press or A Beka Book, or both, Bird said. Both are conservative Christian publishing companies. This could be a troubleseome trend against homeschoolers as well if this situation is allowed to stand. Many homeschoolers also use Bob Jones and Abeka and thus might also be considered "weak" in those areas. I wonder if this will extend to homeschoolers? "The texts in question are primarily religious texts; science is secondary." Interesting distinction. We should all keep an eye on this one. Freshblog talks about something that I have often thought about alot. I would like to suggest that blogs can also have multiple identities. A blog might be very strong on a single topic that only a few folks are interested in, & therefore be a big blog in a small sphere, whilst also commenting less definitively on bigger issues, & taking a peripheral place in a larger phere. There's a social aspect to this too. Regular readers, commenters and subscribers here form a sphere of sorts that has very little to do with any "top 500" action, but has a great deal to do with how this site develops from day-to-day. Those readers also contribute to other spheres, many of which I am not a part of. That sense of multiple developing communities is one of the things that I find so involving (addictive?) about this process. This is very true for me. I gravitate in and out of a variety of sub-spheres and read about alot of different issues but my blog is education and family related (a sub-sphere). I would have to work alot harder at this than I am willing to and probably write about things that I don't desire to - in order to make it in the larger sphere. So rising status is a non-issue for me. But I do find it interesting all the sub-spheres that are generated and the popularity of the bloggers among them. More interesting is reading all the strong well written opinion on a given issue. Things I would never imagine thinking about, others spend all day dwelling on. Blogging is an amazing thing when you think about it. People who would otherwise never interact are doing so on a daily basis exchanging thoughts and ideas. Does anyone else think about this too? Or am I just becoming one of the crazy nuts in the sphere that others just shake their heads and wonder...Why is she talking about that? 1. State control of education is necessary, because an educated populous is essential to good citizenship and the perpetuation of our democratic government. 2. State control of education is necessary, because it ensures the transmission of commonly held American cultural values essential to the population of our institutions. 3. Education is necessary to take care of the poor that would not be educated any other way. The rich will never voluntarily pay for the education of the poor. Are there other reasons why we have a public education controlled by the civil government? I understand that there are also variations on these three but are there others? This is for a long term project I'm working on. But I'd love to find out if there are other reasons for a public education system. I will also go over how he answers these arguments in subsequent posts but feel free to let your thoughts be known about these arguments as well. Note: Kerry Morgan, is an attorney and homeschool father of 5 in Southeastern Michigan and a personal friend. Wal-Mart Stores (Research) said it would donate $1 million to the Salvation Army for relief assistance such as meals for victims and emergency and rescue personnel. The retailer said it would also accept customer donations nationwide at all of its stores this week as well as credit-card contributions through walmart.com. Someone ought to WAKE UP the NEA and let them know about the hurricane. I'm sure donations from the union will be pouring in as soon as they become aware of the enormity of this disaster. Maybe they'll even call of their boycott of this "evil" coorporation. Here's a list of other corporations donating to the relief effort. Up until this weekend, my daughter and I have been sharing a computer with my husband, his blog, and his business. We would both wait for a break or an appointment and then check e-mail and the blogs. But now..... we have our own computer back from repair and WIFI. I feel like a whole new blogger. I think my hubby felt like we were pesky flies invading his picnic. But now Spunky Jr. and I can feast in peace without being swatted away. And my husband, he's free at at last of those pesky flies perpetually buzzing around him. I finally had time to update my side bar, and blog roll. And now I should be able to visit other sites more often. (I love RSS feeds!) So let me know if I have forgotten to add you. I have written extensively on a parent's willingness to outsource more and more of their responsibilities to the schools and state. Here comes another example courtesy of Edwonk....The Power Breakfast. When kids head back to school this fall, many will be starting the day off right with a quick, nutritious breakfast --at school.Before that first bell rings, ready-to-eat Breakfast Breaks(TM) will be served in school cafeterias, in classrooms, and even right off the school bus, which many schools hope will increase participation in the federally-funded national School Breakfast Program. The breakfast of champions courtesy of the federal government. And why are they looking to increase participation in the program? Why don't they just take the children full time and let the parents check them out like a library book when they want to spend time with them? It seems to be the next logical step don't you think? I posted a few days ago, "Why Do We Educate". Here is a short maxim that I often repeat to myself to keep that goal in mind. Don't sacrifice Heaven for Harvard. It's easy to get caught up in the academics and sacrifice the relationship and time with God. We all want our children to succeed. The bar of academic achievement is set very high for homeschoolers. They are expected to be near genius and anything short of that is often viewed as failure. Many quit homeschooling because this self-imposed pressure is just too great. That is unfortunate. I've been homeschooling long enough to see many chilren who are "academically successful" surrender their moral and spititual convictions as they move into adulthood. I pray that I never place academics on such a high pedestal that my children no longer see the Author of the knowledge. Harvard is nice but Heaven is where I'm aiming. I have two sons who, from time to time, have contemplated going into the military. Recently, the book From Basic to Baghdad has been circulating around our house. All three of my older children have read it. Now it's finally my turn. The book is written by homeschool graduate JB Hogan and son of Maggie Hogan. It's a compilation of his letters home that his mom then distributed by e-mail to anyone interested. I'm about half way through the book. I'm reviewing it for The Old Schoolhouse Magazine. So look for a formal review there. But I will say I am enjoying it tremendously. With all the press a certain military mom is getting lately, I hope people will find time to read about all the ordinary kids who are willing to sacrfice their time and lives for our freedom. Here's a video clip that aired Thursday during the 10PM news in Oklahoma. It is worth watching to see how the media is portraying homeschooling. The reporter is dicussing homescholing and the need for government oversight for homeschooling because of abuse and neglect. The story is contradictory because it is obvious in this case that when there is true abuse the laws are available and applied. Abuse is sad in any family - homeschoolers included. There are church and legal remedies to help in these situations. But increased regulation of the homeschooling community accomplishes nothing to help in that effort. But more and more stories like this are going to be used to create a ground swell of support for increased government regulation. Holy Family School provides a detailed transcript with their analysis. Hat Tip: Jake Smith who also lives in OK and offers his thoughts as well. The Princeton Review and US News and World Report released their findings of the top colleges in the country. Human Events Online has the scoop. A top-notch college education no longer means four years of liberal indoctrination. According to the experts, schools that promote conservative values are among the nation's best. The Princeton Review and US News and World Report released their lists of the best colleges for 2006, and once again, institutions that upheld conservative principles were recognized for their excellence in education. The Princeton Review's list included 20 schools where students who were "most nostalgic for Ronald Reagan" could be found. Ranked at the top was Hillsdale College in Michigan followed by Grove City College in Pennsylvania and Brigham Young University in Utah. Other schools that made the list included the U.S. Naval Academy, U.S. Military Academy, U.S. Air Force Academy, Texas A & M - College Station, Baylor University, Southern Methodist University and Clemson University. US News and World Report's list recognized many of the same schools, but it included two other noted conservative institutions - Calvin College in Michigan and Liberty University in Virginia - as centers for exceptional learning. Meanwhile, the growing popularity and success of conservative colleges across America is troubling for the political left. They believe college is a time and place where liberalism thrives and conservatism dies. When the political left is worried, I'm smiling. Scott Somerville offers his thoughts on bias in higher education. Chris O'Donnel and ExPat are having a blog conversation on education. ExPat threw out this challenge. So I ask you, Mr. O'Donnell, do you know why you are teaching your children what you are teaching them? Who defines the "educational goal"? Before we can ever begin to think about how we are to teach a child, we must decide why we are to teach a child. What is a "well educated child"? I had a mother call me sometime ago. She had received my name from a mutual friend and she wanted to home educate her son. He was currently enrolled in the local public school. Her first question was what she needed to buy to home educate. Before answering, I asked her a few questions. My first question was "Why do you want to educate your son? She responded with a series of reasons on why she no longer wanted him enrolled in the local school. "Okay, so you are dissatisfied with the public schools", I replied, "But that doesn't answer my question. Why do you want to educate your son?" She then replied with the some of the benefits of home education and how they do so much better that the public school. I responded again, "I am glad you want to home educate but you still haven't told me why you want to educate your son?" She was getting a little frustrated so I rephrased the question this way "Move past the method of education and ask yourself , "Why do you care that your son knows anything about anything?" She paused mementarily and then said, "Well, I guess I would like for him to make a good living for himself so that he can afford to do the things that he wants to do and to be happy. And a good education will do that won't it?" "Sure it will, but let's take that and move forward about 30 years. Your son is now a famous millionaire who can afford to travel the world. You are back here in Michigan sitting in a nursing home. He pays all your bills but only visits sporadically. He is happy but you are ignored and miserable. Would you consider yourself a success at the education you have provided?" "No", she admitted. She began to realize that academics was only a part of a well educated adult. She then turned the tables on me and asked me why I educate my children. I responded, "My children's success is not determined by a degree or a dollar. That a well educated child is one who knows and loves the Lord their God with all their heart, mind, soul, and strength, and loves their neighbor as themselves." She acknowledged that these were not her goals but that she didn't really know what an well educated child would be for her. This is sad. The point of this story is not to convince you that my educational goal should be this mother's educational goal but to illustrate that the goal must be defined before the methodology can be determined. I could have given her a list curriculum to buy but she probably would have found it unworkable for her (maybe even offensive!). WHY we educate must be determined before we decide HOW to educate. The public schools have a reason to desire a uniform, "equal", edcuation for its citizens. But an equal education is a fallacy because we will never all have the same educational goal. Thus, what one may call a success another would call a complete failure. This is the great dilemma of the public schools. "Equal education" only works with a uniform goal. A goal which works well for the state but usually leaves the individual out in the cold. Since it's Friday, I thought I'd do my own neme and share some things about myself. 1. I'm almost 5'2" (if I stand very straight) and three of my six children are taller than me. 2. I usually don't eat after 7PM and I've never been on a diet. 3. I have been on TV three times. When I was 5, I was Belinda on Bozo; I was on a game show called Bowling for Dollars with my dad when I was 8; and as a mom, I debated a lesbian on TV. I had the most fun at my last appearance. 7. I married a man who can do all three very well. 8.I'm 42 and to the dismay of many friends have little grey and have never dyed my hair. 9. My daughter and I went to Hawaii for 10 days and spent less than $200 total. It is quite apparent that you seem to have some sort of 'beef' with Mrs. Pearl.....you know, when you write a book~the publisher is only going to print so many pages....... you cannot cover every human beings every particular situation. I have no offense with her;. I do not know her. But I am reading what she has wrtitten and examining it in light of her past words and the scripture. She is required as a Titus 2 woman to teach that which is good. It is the responsibility of all of us to hold each other accountable. Mrs. Pearl holds us to a high calling I am only asking her to meet the same standard she has called us to. This book is self publsihed by No Greater Joy Ministries and not under the constraints of a publishers requirements. She was free to include as many pages as necessary. I think that generalizations are used here. The letter to Mr. Miller was not a generalization but very specific. If she wanted to make a general statement about a woman meeting her hsubands physical needs she could have done so without a specific letter and then accusing the women of blasphemy. I also think that Mrs Pearl expects us to use our heads, folks. That is eactly what I am doing when I examine her work. Why is it considered trashing the Pearls to examine what they write and compare it to past writings and the scriptures? That is a personal accusation (albeit her opinion) and one I would ask you to support with something I have written. Again, I have said that I agree with some of what is written but that doesn't excuse the false teaching that is in the book. As a Titus 2 woman Debi is held to a standard of teaching that the bible requires. That is teaching that which is good. That may be true. However, adultery is a leading reason men lose interest in their wives. Debi doesn't consider this when she answers this woman. She also does not consider that the man has blasphemed. The scripture is not gender specific. If it is blasphemy for the woman, it is blasphemy for the man. Women do often use poor excuses for refusing their husbands. And Debi is right to point that out. But from the letter to Mr. Miller she doesn't consider that the man may have issues (AIDS, cross dressing, etc.) that would lead to the woman's refusal. She accuses the woman of blasphemy without any detailed knowledge of the situation. That is not wise to do. Something Debi said she would not do in her earlier writing is make judgements based on one letter. Yet that is what she does. I am not bothered by dissenting opinion. But if you disagree do so on the substance of what is said. Most people agreed that the book is negligent in its handling of domestic abuse ssues, but over and over the common argument in its defense is that we are supposed to discern for ourselves. "No teacher will ever be 100% accurate; we should keep the bad and throw out the good." "Have some common sense!" one woman exclaimed. That's sad, because we need good books on being godly wives. We need to have good examples of submission from women who don't apologize for it. Unfortunately, you need to look in a different book. It is not my objective to sensationalize this issue or "stir the coop" but to directly answer those who feel that I am the one in error for posting my review on a blog and not just praising the helpfulness of this book. Holly asked in a comment if abuse and adultery are rampant in the homeschool community. Sadly, it is more common than we might like to believe. I was an abused wife. The sole reason I stayed in my marriage was due to the guilt placed upon me by views such as this about divorce and submission to one's husband. Christians caused me to stop listening to God's voice in my own life and listen to THEIR OPINIONS of His words. I sat in reverence before during and after I was bouncing down the stairs to my basement (Can you imagine trying to prove that the bruises you have are from being kicked down the stairs as opposed to fallinfg down?). I sat in reverence while I was being tripped and pushed around my home on a regular basis in front of my children. I sat in reverence while I was kicked over a bed when I was 5 months pregnant. I was ever so reverent when my ex husband closed me off from the world, taking my keys, my wallet and disconnecting the phone. I was ever so reverent when things were being thrown at me. I was so reverent, that I never called the police and I never told a soul, until after my divorce. Sadly, a divorce my have been prevented had there been accountability and intervention before things got to this point. Just as sad, many women are believing the opinion of others without investigating the scriptural truth for themselves. Adultery is also far more common than we want to admit. I have known more than one homeschooling family that seemed "together" who have experienced the turmoil of this devastating sin. Woman have a role to play in the relationship but books that refuse to let the woman know that it is not all up to her to hold her husband accountable are hurting the testimony of Christ, the church, and homeschooling. Not to mention the "lessons" that our boys are learning about how to treat women. Church and legal remedies are available to hold husbands accountabile for their wrong behavior. It is not just about reverence for the women. It is about truth and accountability. Scott Somerville is writing about 65 Canton, OH girls who are pregnant out of a total of 490 female students at a local high school. That is as an alarmingly sad statistic. It all started with the truth of Titus 2:12-13. Those verses say that God's grace does not automatically keep us from worldly passions. In all of your love for God, you could be blind-sided by worldly passions. When I realized how difficult the path of purity can be, I stood before God and I said, "OK, teach me to say no. I know these worldly passions exist, but I know the only way I will be able to say NO is if you teach me!" And from that moment on, God worked in me and gave me a resolve that I did not even know that I had within me and the path...and the waiting...was much easier. The difference was that now I had placed myself in God's presence to be taught how to say no. God's grace taught me to say no to worldly passions.You cannot attain purity all on your own. I cannot unveil to you some formula of protection. Your parents cannot share with you something that will keep you innocent. Parents and the public schools will never solve these dilemmas until they realize that the Creator of life is our first teacher of truth and wisdom. Also, the EdWonk has his Carnival of Education up. It's always worth a visit. Scott Scomerville has started a blog called Somerschool (fitting name!) at Homeschoolblogger.com. Here's some of his first post. From my vantage point at HSLDA, I've gotten to know a lot of families here one or more children has turned away. Sometimes it's easy to see why--a self-righteous and controlling mother, or an angry father who "exasperates" his children instead of modelling the Heavenly Father's love. But there are other times when there is no earthly reason why a child should turn away. If homeschooling was a magic "recipe" that always turned out good little Christians, it would be perplexing. Why would Jesus need to die on a cross if we could get the same results with an educational method? If God ignored the faitfh and prayers of parents who lay down their lives to lead their children to Christ, it would be perplexing. When Jesus tells us to ask "anything" in His name, surely He meant to include the thing we long for most: the salvation of our children! For now, I resolve my perplexities by reminding myself that these children who turn away are still children, in a real sense. They have a lot of life ahead of them. It is right for us to weep over them as they stray... but they are prodigals, by and large, and the story isn't over yet. Let us keep asking our Heavenly Father to bring them home! Wise words from a father of 6 who understands who is really in control of our children. Scott is a staff attorney with HSLDA. His wife Marcia is the author of Tapestry of Grace curriculum. It is great to see him blogging. I plan on making his blog a daily read. All over the news we're hearing the results of the latest round of ACT scores (Joanne Jocobs has a story) . Edwonk provides a recap of what Education Secretary Spellings had to say. The ACT Assessment scores contain reasons for both optimism and action. We are heartened that scores remained steady even while the number of test-takers increased. Since 2001, the number of test-takers has increased by 11 percent, with Hispanic students up 40 percent and African American students up 23 percent. But a deeper look at the data suggests that too many students remain unprepared for college. ACT's College Readiness Benchmarks show little or no improvement, particularly in math and science. One of the reasons that there might be an increase in the number of students taking the test is that more states are now requiring the ACT for graduation. Michigan will begin requiring it for graduation in 2007. Colorado and Illinois already require it for graduation. See related article here. So when you realize that students who wouldn't normally take the test are now taking it, it makes perfect sense that participation would increase but scores would not. The test is no longer just the ACT polling colleges and deciding what to put on the test. It is the ACT working with the government to determine what should be on the test based on what was taught. They have also added a work skills component. As more and more states adopt the ACT as the test of choice replacing their state exams we will have a de facto national exam. This is a back door way of regulating curriculum without legislation. This is bad news for homeschoolers. Homeschooling: now that's blogosphere gold yet to be dug. Don't let the number of homeschooling blogs discourage you. It's how you gather and process the information that sets you apart. To build an expertise in homeschooling, you'll have to make the effort to do actual reporting and information gathering. And someone trying to do just that is Agent Tim. He has started a website called Wake Up the NEA. He's trying to get a counter campaign going to the Wake Up Walmart campaign started by the NEA. If you're interested put this button on your blog and let everyone know that you're shopping at Walmart for your school supplies. Make sure you also leave a comment at Wake Up the NEA and let Tim know you support him. He's also looking for others to help out. Many thank's to Agent Tim for a starting a blog Wake Up the NEA to get the word out about the NEA and Walmart. Here's why he started this campaign. He has some great graphics and he's looking for others to help maintain the blog. I think that with enough blog support we could get some attention on this and let the NEA know that preserving the union is not our first priority in education. As you begin homeschooling, I thought I'd share a few words of advice and encouragement from someone who's been there. You are about to begin one of your most challenging and rewarding days. Don't be surprised if your excitement is tempered with a little nervousness. You'll probably fret alot about the first day. Should you make it a special event? Or try and be low key? Knowing you, you'll probably even wonder what you should wear. My advice is go comfortable. The day will be longer than you think and nothing like you expected. So try to relax and enjoy it. (I know, easy for me to say!) And knowing you, you'll probably have have the schedule already made out. Exactly what should happen when. But if your children are anything like you, they'll probably wake you up before dawn. Eager to begin before you can even think a coherent thought. There will be frustrating moments -today and throughout this journey. Moments when you will wonder if you can continue and moments of calm that you wish you could bottle and carry with you forever. This cycle will continue for what seems like forever. Your husband will be there for you. Lean on him. When you are weak he will be strong. But sometimes you will look at him and wonder, "Does he really get what I'm going through?" In his own way he does. Trust him. And trust God to speak to him and keep a quiet heart. The day will go quicker than you can imagine. Before your know it, it's lunch time. You didn't get as much done as you thought in the morning. So you grab a quick bite and push hard the second half of the day until you're done. It's finally over. What a story you'll have to tell your friends. It wasn't as hard as you thought. Your husband cheers you on with a kiss. And then....the doctor puts that baby in your arms and says, "It's a girl." You relax so much more now. I couldn't be prouder of you. Congratulations! You've survived your first day and the joy will be with you forever. You've just overcome one of the biggest hurdles of homeschooling. And the rest...well, let's just say "it's academic". This would be laughable if it weren't so sad. When Kerry Liberman enrolled her 3-year-old son at a Virginia preschool, she got something she hadn't bargained for: some heavy academic pressure. Teachers right away asked if he could write his name yet. He had been developing well and Ms. Liberman hadn't had any concerns - until then. "You do realize he's only three, don't you?" she asked. But when the teachers implied her son was behind other children and suggested she "start drilling him immediately" with flash cards, she says, she did so. "I thought I had to jump on the bandwagon." As millions of parents sign up their kids for child care and preschool this fall, they will unwittingly be taking sides in a growing debate over what educational philosophy is best for very small children. A mounting government push for accountability in prekindergarten programs is driving many toward more skill-building and testing. Will someone please stop the insanity! He's only 3. And the best educational philosphy is called MOM. If it were up to me, schools would take their biggest break from Thanksgiving to New Year's. Takes in lots of holidays and saves on snow days.Then we'll take the rest of the time off and scatter it throughout the year. Hmmm, let's say a week for President's Day, Easter, Memorial Day, July 4, Labor Day and Halloween. But alas, few schools have adopted my brilliant flexible-schedule strategy. Looks like the only way I'll get to pick my own schedule for my kids is if I home-school them. But there are the reasons she could never do it. When I think of what I had to go through last year just to get my son to do his first-grade homework...if I actually had to get him to do ALL his schoolwork, he (and his siblings) would be illiterate. Anyway, I just don't have the stamina for it. As much as I love my kids, I could not handle being with them 24/7/365. I need a little breathing room, and so do they. That must be the real reason our forefathers made schooling mandatory - not to make sure the kids were educated, but to get them out of their mothers' hair for a little while. First grade homework? That alone would make me WANT to homeschool. If someone had my children for 7 hours a day and couldn't get it all done... I'd be looking for the exit real fast. No one has my child that long and then assumes they can take up what precious little they leave to me. But then again, this mother does admit that the children are not there to be educated anyway. The NEA wants to send Walmart back to school with a campaign called Wake Up Walmart. And encourages parents to boycott Walmart this year. Think you just got a bargain on those rolled back prices? Think again. You may have just helped break unions and dismantle public schools. The company has drained billions from public coffers — money that could otherwise fund schools. And the Walton family, multi-billionaires thanks to Wal-Mart and Sam's Club profits, contribute heavily to anti-public education efforts like private school voucher initiatives and anti-public educations PACs. Couldn't the same be said about the money spent on this campaign? Shouldn't it be going to educate the children? Oops! I forgot, we're not supposed to question the teachers. Well I'd like to start a counter campaign and call it Wake Up NEA. They are not your children. I am pro-choice in the education of my children. I believe I am free to choose where my children go to school AND where I buy their school supplies. I hope you will join me in this campaign and buy your school supplies at Walmart this year. YOU are in charge of your children's education NOT the NEA. Here's an editorial in the Boston Globe written by a homeschool graduate who sees things the same way. Update: Homeschooler Agent Tim has started a blog called Wake Up the NEA that is for the purpose of encouraging support of Walmart. If you've ever wondered about the book The Purpose Driven Life by Rick Warren... Agent Tim has a great conversation in his comments section including some of the people at the very center of the controversy behind the book. Both Richard Abanes and Ingrid Schlueter have left interesting comments. My point in brining this up is not to get into a discussion of the book, I have not read it. But to show you what a great homeschool kid and a purposeful blog can accomplish. Way to go Tim! Did I mention that Tim is also part of the excellent blog team for Virtue Magazine? I received this today from Citizens for Traditional Values. I registered our family. If you're from Michigan this is worth considering. Forget Wife Swap this is my kind of reality show. Professor William Wagner and the Center for Ethics and Responsibility, invite you to attend a lively debate centering on the public display of the Ten Commandments, faith-based initiatives, and the United States Constitution. Nadine StrossenNational President of the A.C.L.U. David FriedmanAuthor of the U.S. Supreme Court brief on the Ten Commandments, filed on behalf of the A.C.L.U. This program free and open to the public, but space is limited -- so RSVP early. The topic that just keeps coming around is how many children should a family have. I came across it recently again on Sherry's blog. But I would like to share two incidents that impacted our decision. "If you could live life over again, what would you do differently?" The results were near unanimous. "I would have had more children and spent more time with them." The general sentiment was that life had moved to quickly and now they realize what was truly valuable but it was too late. As a 23 year old that had a strong impact on my attitude. I certainly didn't want to be in their shoes in 40 years. That is, having all the money I needed to buy whatever I wanted but no time left to get what was truly valuable. Pastor: "How many here today are living in a bigger house then the one they grew up in?" Pastor: "How many have atleast as many children as the family they grew up in?" This was a congregation with over well 1000 in attendance that morning. So even taking into account non-marrieds and infertility issues the illustration was clear. We, as a society, (and more importantly as Christians) have changed what we place a high value in. This is not to say that as Christians we don't value children but we have come to a place where their value is different in today's culture than in previous times. Raising children is difficult both financially and physically. But I do not want to stand before God knowing that he had a purpose to fulfill in me at this time and I chose to stop it. God can work miracles and he could bypass my obstacles but I seek to be a worker for Christ not a hinderer of HIS plans. In the end, I realize it's not just about how many heads fill my home but how many hearts are born again in HIM. But I also know that there will never be a heart for Christ if the child was never given the chance to be born. I know alot of this testing stuff is boring and not alot of fun to read on a blog. But it is the mundane that usually trips people up. This matters to me because I want my children and grandchildren to have the same choices about their future that I had about mine. With national testing becoming the norm this is less and less likely to be the case. So I will keep writing and trying to inform as many as I can. I would encourage all homeschoolers to take a time to educate themselves on this important issue. Edaction is a great place to start. And it matters so that the kids like those at Virtue can keep homeschooling and have the same options and opportunities as everyone else. Joanne Jacobs had an interesting article on her website a week ago that I wanted to take a moment to spotlight here. Many have commented to me over the last few years that taking a state test is "no big deal." Just take the test. It doesn't matter. It doesn't count for anything. But that attitude could trip up homeschoolers for years to come if people don't understand that there are those who want to "make it matter." Here's the story from Slate's Alexandra Starr in an article called "They're not stupid they're lazy." Look at Texas: In 2004, results counted toward graduation for the first time, and pass rates on both the math and English portions of the test leapt almost 20 points. college admisision, a workplace skills exam, and a social studies component. The test would first be given to students in 2007. The college-admissions test to be used isn't specified in this legislation. Replacing the MEAP with the ACT test would allow results to be obtained more quickly and would save parents the cost of paying for the ACT out of their own pockets," said Switalski. "The MEAP has no bearing on whether a student gets accepted to a college or not. I think the switch would encourage students to take these tests more seriously, ultimately increasing enrollment in Michigan's colleges and universities." And passed as Public Act 594 of 2004 (Effective: 1/5/2005) As more and more states adopt the ACT as the service of choice, the ACT then becomes the defacto National Exam. Thus, college entrance, job placement, and scholarships are all tied to this exam. That is why many states are making it mandatory. Keep in mind that this is NOT the same ACT that we took when we were entering college. This is a test controlled by the state and administered by the testing service. While the stated goal is increased enrollment the real outcome is increased state and federal control over education. No surprise there. Something Mr. Switalkski left out of his statement but included when I debated him on WJR 760 AM a few years ago was that "testing drives curriculum." Whoever controls the test, controls what is taught. And whoever takes the test gets an advantage over those that don't. If you don't take the test you will not have the same options as others who do. Simple as that. Making a test matter to the student has been the a goal all along. With the ultimate goal being career tracking. Here's how one mother from Minnesota described the outcome of her daughter's participation on the state career test. quietly slipping into a programmed education so they will fill society’s labor needs? 8th grade is way too young for some inventory to be determining what career a child should or should not pursue. What they need is a good sound academic, liberal arts education -- the kind of education where they will be free to pursue their own dreams. That's the freedom that is being denied to so many children as testing becomes the norm and the government directs the testing. Leaving parents to find out after it's too late. For a great website with more information please see Edaction.org. I would encourage anyone interested in their children's future and the future of education to spend some time at this site. Interesting read in the Sunday Detroit News about homeschooling. This paragraph will have the MEA shuttering. Joyce Burgess, a founder of the National Black Home Educators Resource association, said a growing number of families are looking for an alternative. "We are fed up with the public school system," Burgess said. "African-American families have seen the horrors of what has happened: children who aren't being taught to read, dangerous situations in the schools. New moms and dads are deciding they just aren't going to go that route." If this kind of thinking get's around...someone's not going to like it. And with the failing Detroit school system, parents are definitely looking for alternatives. publish a monthly newsletter mailed to about 1,000 Metro Detroit families. "We started with our kids, pulled them out of a private school. We couldn't afford it," Gary Holcomb said. "Back then, our meetings were mostly suburban people. Now our groups are probably half African-Americans from the city." The Holcomb's have done and excellent job educating their children and their positive influence in homeschooling is felt all over the city. If you're looking for a reason to continue home educating then look no further than the great kids who put together Virtue Magazine. Jake and Alex of Still Thinking have redone the e-zine and helped get a new Virtue blog up and running. One of the contributing writers to the magazine and blog happens to be Spunky Jr. It's wonderful to see young adults who are putting their time and talents to such productive use. Contributing Virtue writer, Agent Tim, also has done an indepth interview with fellow blogger and German resident, Jeannine about education and life and Germany. And here's a new site that I just found at HomeSchoolBlogger.com called Nature Never Stops Talking by author Sam Alibrando. That's also the name of a book he's written on intelligent design due out on August 15th. His blog is excellent. Not a dry textbook blog. Easy and fun to read. (Black background aside.) And he's looking for a few people to help get the word out about his new book (excellent opportunity for older students). I'm going to make his blog part of our weekly science reading and I hope to get my hands on a copy of his book too! This BLOG is important to me because there are so many fast changes and unfortunately, tactics used to undermine the credibility of Intelligent Design. I do not discuss any of these things in the book but I can discuss these things on this BLOG. And while I'm talking about Homeschoolblogger.com don't miss Blogger of the Week Kim from Upward Call who also has a homeschool blog called Transformity. She wrote an excellent piece on courtship Part One, Part Two, Part Three, and Part Four. Definitely worth reading. Testing, testing, and more testing. It's all you hear about anymore. It's enough to make you want to break every number 2 pencil at Office Max just to make everyone take a breath. I have never liked tests and don't know many who do. I took them of course. I did well on most of them but I still disliked them. From the time I was in grade school I remember my teachers saying things like, "pay attention class, this is going to be on the test." At which point, we would all try and remember those points. So what did that teach us? Sure we learned the material that was to be on the test. But it also taught us that everything else was pretty unimportant. Otherwise it would be on the test too! So the really bright kids learned to pay attention at those moments and sleep the rest of the time. The dumb kids just slept through it all. One of my worst experiences on a test was in my sophomore year at the University of Michigan. I walked in to my entry level Computer Science class which was required for the degree. Before I could even warm the chair, a teaching assistant was handing me a test! What! There must be some mistake! This is the beginning of the semester! How could there be a test so soon? I sat down and listened to my prof explain that the test was to determine whether we had what it took to succeed in computer science. Confident I did, I clicked my pencil a few times and got to work. If you had four steaks and a grill that only fit three write an algortihm for how you would cook them so that they would all be well done and hot at the same time. I can't remember the next one because my test taking skills went up in smoke on the first question. Needless to say, I flunked. Now this isn't surprising. I had no idea about anything computer related. (This was in 1983.) What was surprising however was that I was not allowed to enter the class on the basis of a test about how to cook a steak! I was not about to give up that easily. I went to my prof's office hours to discuss just exactly he meant by his "no future in computer science" remark that he had written at the top of my test. He took one look at my test and started laughing. I stood there for a moment wondering if I should just forget the whole thing and major in political science. (That seemed to be so popular with all my friends.) But in my usual style, I wasn't going to go down without a fight. I told him that the test was a colossal waste of his time and not a very accurate predictor of future success in his class. I told him I was actually the best student he could have because I knew nothing and therefore the most teachable. It was all those pompous, know-it-all computer nerds that he should worry about because they may actual make him look bad! I told him that I really wanted to take his class and that I could pass if only given the chance to learn the material FIRST. He must have liked my logic better this time around because he wrote a pass into the class. It was difficult but I did pass with a B minus. I also went on to earn my degree in Computer Science. What's the point? Current performance on a test does little to determine future success. Determination, hard work, and a desire to learn will never be accurately measured on standardized tests. Let's just teach our children and let them determine their success. I AM WONDER WOMAN! Yes, it's true! But before you click off in total disgust at my apparent arrogance let me explain how I came to this profound conclusion. I can do it all. Have lots of babies while my husband is in night school and working full time. Potty train all my children by 6 months and use only cloth diapers before then. Wear a size 6 outift the day after delivery, that I sewed the day before delivery. Home educate using only "living books" that are still sprouting roots from the binding. Eat only organically grown non-genetically modified foods where no animals have been harmed. And in my free time tell everyone else how to do it too. Yep, that's me, I AM WONDER WOMAN. I wonder if I'm doing anything right? Are the children learning anything? I'm beginning to wonder if I am going nuts. Becoming gen-u-whine squirrel feed. I wonder why I ever thought that I could do this? Did Charlotte Mason ever have a bad year? I wonder what Debi Pearl would do right now? I wonder what's for dinner tonight? I wonder when the last time my children's sheets were changed? I wonder why I don't care when the last time my children's sheets were changed? Yep, that's me I am wonder woman. "Who am I, O LORD God, and what is my family, that you have brought me this far?...There is no one like you, O LORD" 1 Chronicles 17:16. I stand in awe and wonder before a faithful God. Thank you Lord, that I am not the woman I used to be. I truly am a wonder woman. Stacy at Mind and Media is always working hard to find fun and informative material to review. I'm excited to be selected to receive a one year subscription to The Rare Jewel. Here's a brief description from their website. Feel confused and frustrated about your Christian role in American politics and culture? Do today's issues seem complex-need black and white clarity in an easy-to-understand format? Looking for brief and accurate insights about today's news and trends, and how they impact your life? How would you feel if our currency no longer included the affirmation, "In God We Trust"? Want to make a difference but don't know how or where to start? Equip yourself with knowledge and protect our nation's Christian heritage. Rare Jewel Magazine will deliver to you knowledge and analysis that you won't find in traditional information resources. When a construction worker builds a house, he usually straps his tool belt to his waist so that the necessary tools are at his fingertips. Ready to use at a moments notice. It makes no sense to constantly run around looking for the necessary equipment and learning how to use them as he works. The best builders are those that have the tools ready and know how to use them. The same is true in critical thinking. It is helpful to have the "thinking tools" available so that whether we are reading a book or listening to a sales pitch we can have the necessary tools in our mental tool box ready to guide our thinking and our choices. However, the tools for thinking are obviously not hammers and saws. Instead, we rely on the the rules of logic and reasoning skills to help develop our thinking. Most formal logic course are philosphical and offer few practical helps. But the Bluedorn brothers have come up with an introductory logic series that will provide most with the tools they need to help construct a logical argument and also to evaluate when to use them. The book is written for students age 13 through adult. There are 35 lessons that will help develop reasoning skills. The topics include "Tools for Thinking", "Tools for Opposing Viewpoints", "Tools for Science", and "Projects". Each lesson is about 3 pages long. They provide fun dialog and cartoons that help make the material easier to grasp and retain. Along with the text, they provide exercises that the family can work on together and apply immediately. The book could be read and completed independently by an older child. I plan on using it in the fall with all my children as a read aloud before they begin their independent work. The discussion questions are excellent even for smaller children. Even if they don't grasp some of the logical concepts, they will enjoy the simple examples and learn right along with their older siblings. We worked through the Bluedorn's first book, The Fallacy Detective, in a similar fashion and it went very well. I have had college level classes in formal logic and I found this book entertaining and informative. The reasoning skills learned from this book along with their companion book the Fallacy Detective provide a great entry into the study of formal logic. But more importantly, these skills will give our children the tools necessary to think clearly in their daily lives. 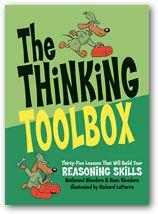 A complimentary copy of The Thinking Toolbox was provided by Mind and Media for review. I have written about why I started my blog. And I've also blogged about discovering my "blogging voice", but now I'd like to talk about my attitude and principles when I blog. I try to keep these principles in mind as I blog each day. God is bigger than the blogosphere. This is a principle I apply to all areas of my life. It is easy to be swayed by the blog culture and hot topics. But not all that is bloggable is biblical. I don't want to establish what I believe based solely on the beliefs of an eloquent blogger. If someone can talk me into something, someone else might be able to talk me out of it. Scriptures says, "Study to show yourself approved unto God a workman that needeth not be ashamed rightly dividing the word of truth." 2 Timothy 2:15. I read a variety of blogs. Some I have absolutely nothing in common with and others that are directly opposite my views. But I read what they have to say to get a different perspective and gain clarity on my thoughts. I don't feel compelled to accept every idea that's out there. However, it can be helpful to read well written ideas that present a reasonable argument on a given topic. I don't feel threatened by them. I learn what I can and move on. It is easy to get caught up in the glitz of blogging and the clamor for attention. Who wouldn't want to achieve mortal human status? We all want our "15 minutes of fame" and blogging can do some of that. But when I seek noteriety, it usually backfires and I get noticed for all the wrong reasons. I hope that if someone links to me it is because they like what I have written. It's exciting to be noticed but it's alot more gratifying to receive unsolicited encouragement from someone who was helped or encouraged by something I wrote. These are the principles I have established for my daily blogging activity. It helps guide what I write about and keep my attitude focused when I am in the blogosphere. I have not talked much about HOW we actually home school around here or specific curriculum choices we make. And that is intentional. Homeschooling is a very individual thing and what works in one home may be a complete failure in another. That said, I will share some guidelines about how we go about choosing curriculum. This is from a post I did a while back. When I began homeschooling, "What curriculum do you use?" was the first question I wanted everybody to answer. I devoured magazines and catalogs soon after they arrived. I also attended a variety of conventions and support groups to keep up with what was available. Seeing all that was available left me with more curriculum choices than I ever dreamed and more confusion than I wanted. And that was 20 years ago! (way before the internet!) How do you choose from all the options and opinions which is right for you? Here's how I wish someone would have responded to me way back then. Before choosing curriculum I would encourage anyone to do a study on knowledge and wisdom. What does the bible says about each and how they are acquired? Contrast that with the bible says about the foolish. This will help formulate what God sees as needful and which is most profitable in the education of your children. Before choosing curriculum there are a few other considerations that may help make that decision more obvious. 1. What type of a home do you want to have? 2. What do you desire a typical day to be like? 3. What input and interaction do you desire your spouse to have in this whole processs? 4. What type of a relationship do you desire between siblings? 5. What are the unique traits that God has placed in your children that make them easier and sometimes more difficult to teach? 6. What notions do you have about what your desire your family to be like in 10 or 15 years? 7. What do you think a well educated child means? 8. What notions does your spouse have? How do they compare? 10. What did you like about school when you were young? What did you dislike? 11. How would you describe a successful homeschool experience? These answers may lead to more questions but that will lead to a better curriculum decision. There are no correct answers and different families will give different answers. That is the benefit to homeschooling...God using this tool to train His children to be who HE desires them to be. I believe homeschooling is God's calling but it will not look the same for every family. I could just as easily tell you everything that we have done and you can just plug it all into your day and move on. Or you could decide that you like the way another family does it and use their "method" instead. But that would not be fair to you or your children. You and your family must seek the Lord together as you gather the counsel of others. Considering the questions and thoughts I have outlined, I hope will spark you and your spouse to come together and decide what are the ultimate goals in educating your children and then other "curriculum" choices will be easier to make. While most would agree that we desire our children to grow in their knowledge of Christ and in Godly character...How that is best achieved will be different in each family. Remember you are not only training your children but you are also training them in how to train the next generation. God is also working on you and your own personal growth and relationships at the same time. The decision about what curriculum to use is only one of many you will make in the discipleship of your children. Your are going to make good decisions and you will also make mistakes. Learn from both. Lastly, I want to emphasize that the best place to learn about all education is from God's word. You and your family will never fail with the Word of God as your primary source for all wisdom and instruction. For some strange reason my template is not loading properly. Perhaps its just the evolution of blogging that has caused this. But the Intelligent Designers at Still Thinking will be on the case soon enough to correct any errors in the blogging record. Thanks for your patience. Update: Thanks to Jake and Alex for fixing the template. If you need blog or HTML help I can't say enough good things about them! They are a great team. Mom: Josh, come dry these dishes please. Mom: Josh, I asked you to come dry the dishes. Josh: Sorry, I guess I didn't hear you. Mom: But you said, "yes mom." Mom: Remember, what does a wise son do? Josh: Listens to his mother's instruction. Mom: Right, (moving into sermon mode) God had to tell us to do the things that do not come naturally. A son must be told to be attentive to his mother's instruction because it is not usually in his nature to do so. Mom: No, God had to tell us not to eat too much. Josh: Hmm, How can you be an American and a Christian then? I've had a few e-mails wondering if I am opposed to homeschoolers taking state standardized tests. The short answer is yes. For the long answer I'll refer back to a post that I did earlier Someone Get's It. The article is a review of SB291 in Montana. Here's a few nuggets of wisdom that are so refreshing to hear! The notion of imposing standardized testing requirements is misguided for the same reasons. Requiring standardized testing in public schools makes it possible for Parents (the bosses) to assess the performance of the schools (their Employees).Home-schooling parents may well look to tests to gauge their Effectiveness and their children's progress. But while public schools must be accountable to the public, parents aren't accountable to the public schools. Imposing testing requirements is wrong. That summarizes philosphically why standardized testing is unnecessary for homeschoolers. On a pratical level, there are reasons that the government would like to test homeschoolers. And the best way to summarize those is "Remember Germany". Friend: "Hey, my kids are fast approaching computer age.... You have lots of kids. Can you tell me what's the best internet filter? " Friend: "Oh, I was hoping for something a little more convenient." Me: "Sorry, nobody loves your kids like you do." Well, times they are a changin'. I can now say with "great confidence"
Kathleen Parker enters the Intelligent Design - Evolution debate and offers this observation. If adults find the issue that compelling, might not high school students also? I realize students have been rendered nearly insomniac by the intense level of intellectual stimulation commonly found in public schools, but what's the harm in spiking the punch a little? Compelling, intellectual conversation? What's that? Every child knows that the only thing that really matters is, "Will this be on the test?" It's bad enough when the children ask it but you have to wonder about the real state of education in our country when the teachers start asking the same question. If students' knowledge of intelligent design isn't going to be assessed, (per NCLB mandates) then why does the President want the nation's teachers to spend valuable class time teaching it? After all, if its not on the test, it can't really be worth knowing...can it? eat too much they eventually kill the appetite. It seems that some educators are starting to figure this out as well. Number 2 pencil quotes an English teacher lamenting how schools are destroying the love of reading. Faced with declining literacy and the ever-growing distractions of the electronic media, faced with the fact that - Harry Potter fans aside - so few kids curl up with a book and read for pleasure anymore, what do we teachers do? We saddle students with textbooks that would turn off even the most passionate reader. But will the educational establishment pay any attention? I am married to my husband, Curt, and we have 9 children from 19 thru 2 years of age. We are home schoolers and we attend an Evangelical Free Church. We are born and bred "cheeseheads" and we now live right over the border in Illinois. I'm looking to what a "cheesehead" mother of nine has to say and I thought others might as well. Judging from her first two posts I'd say she's off to a great start. And it looks like Molly's site My Three Pennies may need to be renamed into "My Three Bloggers" since Jenna and Holly have now joined with Molly to do a team blog. Glad to see Holly back into blogging again. A person can only teach what they know. Having home educated for nearly 12 years, I have come to realize that I am less a teacher and more a student learning right along with my children. I often hear the argument from parents that they can't homeschool because they don't think they know enough. They don't feel qualified. Must a teacher know something before they teach it? Sure, in a general sense that is true. (A mother who cannot read would find it difficult to teach a child.) But I am not as convinced that we must know the material for our child to learn it. A mother can learn right along with her children and both profit greatly from the experience. She doesn't always have the wear a "teacher's hat" for her children to learn a subject. I NEVER had a history course. It's true. I am a college graduate who never had a studied US or World History. Before high school it was Social Studies which is not quite the same. My high school history teacher died (we had a series of useless subs) and I never took it at the University of Michigan. And yet, I think that my children have a better grasp of history than they do math. And that was my strength. Amazingly, my knowledge of history is very strong now because I have learned the material right along with my children. And my enthusiasm for the subject made their interest greater. I think they might have actually profitted more from my lack of knowledge. "Yes, and God's going to help me fill them as I educate my own children." Hmm, on second thought, maybe that statement is somewhat correct after all. A person can only teach because of WHO they know. The blogosphere is an nteresting convergence of various personality types. Kim at Upward Call writes a humorous analogy to the cliques in high school. There's beautiful people, jocks, etc. and that carries over to the blogs. In her analogy I would be a floater. There is a Floater group of blogs, and here's where I'll reveal my true bias. It's the home school blogs. We home school bloggers cannot be pigeon-holed. We only belong to ourselves. I guess that's the way I was in high school too. Somethings never change. Still I think that blogs are interesting because they allow "conversations" to take place that might not happen otherwise. And that, I suppose, is a good thing. Even in high school the jocks had to talk to the nerds every once in a while! As for me, I'll just float in an out offering my logical, principled opinions when I feel like it. La Shawn Barber is talking about blogging today. She analyzes the academics view of blogging and a professor's view that that blogging will go bust. It's worth a read.